On Aug. 11, a Jasper County game warden was notified by Martin Dies Jr., State Park staff, that a group of campers may have taken an alligator illegally. The warden made his way to the campsite and confronted the group. After hearing conflicting stories from two male subjects, the warden finally got a confession from one that he had killed a small alligator. The culprits were actually in the process of getting rid of the evidence when the warden showed up; had already seasoned the meat, wrapped it in foil and set to go on the campsite barbecue grill, which was still warming up. The warden seized the gator hide, head, and meat. Several citations are pending, along with civil restitution. On Aug. 4, Harris County game wardens were patrolling for fishing violations when they observed three Hispanic males pulling a jonboat from a bayou near Clear Lake. Wardens made contact with the group and discovered the boat was unregistered and had a large illegal gill net onboard. When questioned, the suspects initially denied having any form of identification. When one of the men kept walking toward the driver side door of his vehicle and continued to ignore commands, one of the wardens detained the subject fearing a weapon might be in the vehicle. The warden searched the vehicle and discovered a Kel-Tec. .40 caliber semi-automatic rifle with two fully-loaded magazines, as well as a large machete. The firearm was made safe, and the wardens attempted to locate valid identification for the suspects to no avail. A local Immigration and Customs Enforcement agent was contacted, and it was determined that one of the men was an illegal alien. The suspect was cited for the use of the illegal gill net and the unregistered vessel. Upon request, the firearm was seized for transfer to the ICE agent for purposes of a separate federal prosecution for illegal possession of a firearm by an illegal alien. Jasper County game wardens received information recently about a missing elderly man who had been kayaking on Sam Rayburn Reservoir. A family member who had spoken with the man earlier in the day indicated he seemed disoriented. Three wardens responded to the call with help from the Jasper County Sheriff’s Office, which was able to “ping” the individual’s cell phone location. The cell phone information placed the elderly man in a creek on the Jasper-Sabine County line. Eventually, phone contact was made and the individual informed responders he was stuck in a grass mat and was experiencing muscle cramps. One of the wardens located the individual from land while the other wardens approached by water. The man was in good condition, other than experiencing slight dehydration, and was reunited with family members at the scene. A state trooper observed an alligator tail sticking out of an ice chest during a recent traffic stop, and contacted a Jasper County game warden. The trooper noted there were no tags or documentation on the tail. The warden made contact with the Hardin County resident and seized the alligator tail. Several citations are pending along with civil restitution. While patrolling along the Gulf Intracoastal Waterway for bank fishermen, an Orange County game warden made contact with a fisherman throwing a cast net for bait. When asked if he was having any luck, the fisherman said that he had caught some mullet. During an inspection of the man’s bait bucket, the warden found a largemouth bass that had been taken illegally with the net along with the mullet. The bass was still alive and released back into the water. The cases are pending. On Aug. 17, a Montgomery County game warden used his side scan sonar to check the water around public boat ramps on Lake Conroe for dumped vehicles. While scanning the Scott’s Ridge boat ramp, the warden recorded an image that looked like a vehicle submerged in the water. The Montgomery County Precinct 1 Constable dive team was called out to assist with determining what the object was. They recovered a late model Mercedes Benz sedan that had been reported stolen on June 25. The investigation as to how the vehicle got there is ongoing. In early August, Texas game wardens were conducting water safety enforcement patrol on Falcon Lake when they got a text from a Falcon State Park police officer about a report of a suspicious boat entering Texas waters from the Mexico side of the lake. Wardens contacted the fisherman who made the report and determined the approximate location of the suspicious vessel. While searching the area, wardens observed a “panga” style boat operating at a high rate of speed heading toward the Texas shoreline. During the ensuing pursuit, wardens chased the panga into a backwater cove more than three miles from the U.S./Mexico boundary line. After closing the distance, the wardens were able to prevent the escape of the suspect vessel and approached the area with caution. 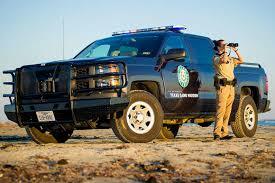 They found the vessel abandoned and beached on the Texas shoreline, approached and cleared the area without incident. Forty-eight bundles of marijuana were hidden under camouflage tarps and filled the vessel from bow to stern. The total cargo weighed approximately 1,100 pounds and was turned over to U.S. Border Patrol agents, Zapata Station. The boat and motor will be processed as abandoned property by Texas Parks and Wildlife Department personnel and the Zapata County courts. On Aug. 8, Aransas County game wardens received a call concerning two individuals on a jet ski in Copano Bay who had gotten separated after the driver was thrown from the vessel with the kill switch lanyard still attached to his arm. Without the kill switch, the passenger was unable to restart the vessel and floated away from the operator. Friends of the two individuals located the jet ski and passenger but could not locate the operator. After searching the area and hearing faint a yell from the bay, the wardens and sheriff’s deputies were still unable to locate the operator. The United States Coast Guard was notified and a helicopter requested to aid in the search after dark. The USCG helicopter located the operator and guided the game warden boat to the victim’s location where he was transported to his vacation residence. Both individuals were unhurt and now have a new respect for the bay and for life jackets. A job well done by the three agencies involved in the search. The outcome could have been a much different and tragic one. Webb and La Salle County game wardens were patrolling the Rio Grande River Aug. 15 when they spotted two boats fleeing towards Mexico. Although the first vessel made it back to the Mexico side of the river, the wardens were able to stop the second vessel and its three occupants. After making contact with the individuals, the wardens spotted a wooden hand-crank fish shocker used to stun fish. The wardens seized the fish shocker and released several large catfish back into the river.